*I prefer not to post actual footage of how soring is performed. If you are unfamiliar with the procedure, please visit the following for more information. Whistle-blowing suppression provision dropped in Florida! Just read this on the Mercy for Animals website. The pressure on these legislators is working. Time and again, MFA’s undercover investigations at factory farms and slaughterhouses nationwide have revealed abuses that shock and horrify most Americans – which is why the corporate animal agriculture industry is fighting so hard to keep the suffering of farmed animals hidden behind closed doors. Thankfully, the latest attempts by factory farmers to conceal animal abuse have fizzled in Florida. 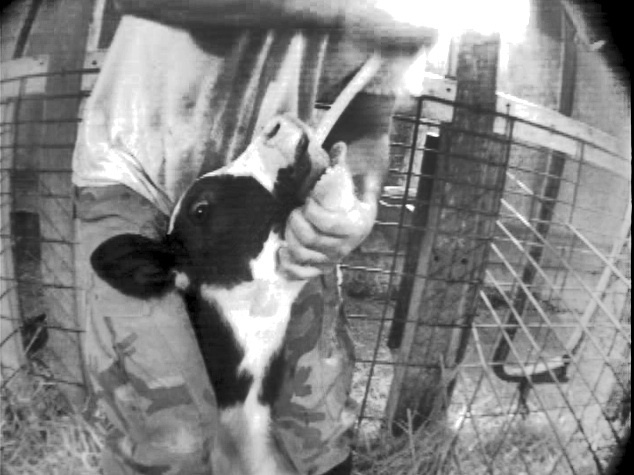 Following two public hearings and facing intense public outrage from caring consumers who contacted their state representatives, Florida legislators decided to remove the controversial “Ag-gag” provision from the larger “agriculture omnibus bill” that would have punished those who bravely expose animal abuse, environmental violations, and other problems on factory farms. While it’s a temporary relief that this dangerous provision was removed from the bill, it is more important than ever for animal advocates to remain vigilant to ensure that shady factory farm interests aren’t able to sneak this provision into another bill at the last minute. It’s also important to remember that similar whistleblower-suppression legislation is still pending in New York, Indiana, Iowa, Minnesota, and Nebraska. What exactly are these pro-factory farm legislators trying to hide? The human population, all eight billion of us, is now connected through international trade and mores that are becoming increasingly common. One area in particular we are finding common ground is the treatment and welfare of both farm animals and companion animals. Ever wonder if there was an international intergovernmental organization that addresses these concerns in an attempt to form a cohesive stand on animal welfare issues? Happily, there is. The World Organisation for Animal Health (OIE) was established in 1924 to improve animal health worldwide. The impetus for its formation was to prevent the global spread of animal-borne diseases that were increasing as a result of increased trade in animals (including both terrestrial and aquatic) and animal products. Now headquartered in Paris, it consists of 178 Member Nations (including the US) that meet annually; each Member Nation has one delegate to represent it. The US delegate is Dr. John Clifford, Vice President of the OIE Regional Commission for the Americas, USDA-APHIS, Veterinary Services Deputy Administrator. Animal welfare means how an animal is coping with the conditions in which it lives. An animal is in a good state of welfare if (as indicated by scientific evidence) it is healthy, comfortable, well nourished, safe, able to express innate behaviour, and if it is not suffering from unpleasant states such as pain, fear, and distress. Good animal welfare requires disease prevention and veterinary treatment, appropriate shelter, management, nutrition, humane handling and humane slaughter/killing. Animal welfare refers to the state of the animal; the treatment that an animal receives is covered by other terms such as animal care, animal husbandry, and humane treatment. I’m ok with that definition. I’m also ok with posting this video that describes some of the agreements made in the Code and shows exactly how some of the Member Nations are not adhering to the document they just signed (yes, that includes the U.S.). Warning – the video is graphic and it will piss you off. The next OIE conference is scheduled for later this year in Malaysia where they plan to address implementing the standards in all Member Countries (really implementing them and not just saying they will implement them.) I’ll keep you informed! Whistleblower. n. One who discloses information, made in good faith and in the public interest, showing objectionable misconduct which is not otherwise known or visible. So why do Minnesota, New York, Iowa and Florida want to enact “whistleblower suppression” laws that would criminalize undercover investigations of their factory farms? The agenda behind these laws would be to label whistleblowers as “agro-terrorists,” determined to harm livestock or damage facilities. As if applying for a job and recording the habitual atrocities occurring in these farms approaches anything a reasonable person would consider to be terrorism. This country knows what terrorism is, and I don’t think any of us believe hiding a camera in your coveralls is considered terrorism. I don’t know about you, but I cannot recall one instance where exposing the crimes being committed in these factory farms as anything but positive. Positive for the animals and their welfare, for the environment, the health and safety of the workers, and for human food safety. I believe that trying to criminalize these undercover investigations is more akin to terrorism than allowing them. Who might benefit from criminalizing these undercover actions? Those involved in profiting from industrial agriculture – Monsanto, the Farm Bureau, and associations that represent dairy farmers and cattlemen, as well as poultry, soybean and corn growers. What do they have to fear? What are they hiding? What horrors are lying behind the shroud of secrecy? Dr. Temple Grandin suggests that these facilities install 24/7 cameras so their actions are completely transparent. If a facility is doing it right, they won’t care who shows up to watch. Please read the following for more information. This publication, published by the Humane Society Legislative Fund, is a summary of how all of our elected officials voted during 2011 on animal welfare issues. More than just a bland scorecard, the publication describes each piece of legislation and its status in either the Senate or the House. In the past 20 years, a growing body of research has firmly established a significant link between domestic violence, child abuse, and animal abuse. 48% of battered women delay leaving a dangerous situation out of fear for what the abuser will do to the animals that remain in the home. In addition to many states adding pets to restraining orders, Safe Haven programs are increasing, allowing family members to bring their pets with them to shelters (or to provide an alternative care solution while they are in a shelter). This excellent article was published in Juvenile and Family Justice Today, Spring 2010. This collaboration by the Humane Society, American Humane Society, the ABA, and ACTION for Child Protection, discusses methods for child protective services and animal welfare groups to interact in cases where domestic abuse also threatens family pets. Extremely comprehensive; includes a chapter on how to adapt law and policy to include consideration of the Common Bond. When I first started researching this post, I thought it would be more dramatic and persuasive if I reported statistics and hard numbers. You know, the kind advocates usually have to provide to the opposition in order for them to take notice. But I realized this is degrading, because just a single death or instance of unwarranted suffering is too much. Enforcing or passing animal welfare laws should not ride on a certain quota of animals being mistreated and abused. I was also going to provide pictures; startling pictures, taken by those who have seen the abuse first-hand. But I decided not to do that either. There are thousands of videos and images that show proof of what is happening. Just Google bullhook, elephants, circus training, Feld Entertainment, Leslie Griffith, Center for Elephant Conservation, etc. You’ll get lots of hits. What I do think you should know? Although many organizations and individuals have brought legal action against some of these circuses, it is very difficult to prevail or even plead a cause of action in the first place. The Endangered Species Act and the Animal Welfare Act, which are the only federal laws in place to protect circus and other exotic animals, cannot be accessed by citizens (individuals or organizations like the ASPCA or Humane Society). Only the government can bring suit against those not in compliance. Therein lies the problem; the USDA is the government body responsible for enforcing the laws. Sadly, they rarely do. But there is some optimism on this front. Just this year, Ringling settled with the USDA and agreed to pay $270,000 for violations incurred since 2007 ($10,000 per fine equals 27 violations – and this does not cover abuse, only visible neglect). This is the largest settlement any circus has been forced to pay. Also optimistically, organizations continue to push the judicial system to the limit by bringing cases and establishing jurisprudence. Lawyers and advocates are finding ways to bridge the loopholes. Please read the following legal article about the trials and tribulations of protecting circus elephants (and other animals) under the ESA and AWA.